The tour runs July 6-17 with reviews, interviews, guest posts and excerpts. Check out the tour page for the full schedule. Once again, Ellie Alexander has baked up an irresistible treat of a story. Juliet (Jules) Capshaw is just settling back into life in her hometown of Ashland, Oregon. The summer tourist season has come to an end and Jules has enrolled her family bakery, Torte, in an exciting opportunity: a reality baking show filming right in town. Jules has volunteered space at Torte for one of the five competing bakers; what she didn’t expect, was that she would be approached to be one of those contestants herself–or that one would turn up dead before filming even begins. Police detective (and Jules’ ex-boyfriend) Thomas warns Juliet away from any involvement in figuring out what happened to the chef. Even though she found him, Jules has absolutely no desire to be involved in any way, shape, or form. But it just seems as though circumstances keep putting her in the center of the mystery. As Jules tries to navigate the world of working with Hollywood producers and television personalities, she is also trying to figure out her feelings for her estranged husband and her ex-flame, Thomas. 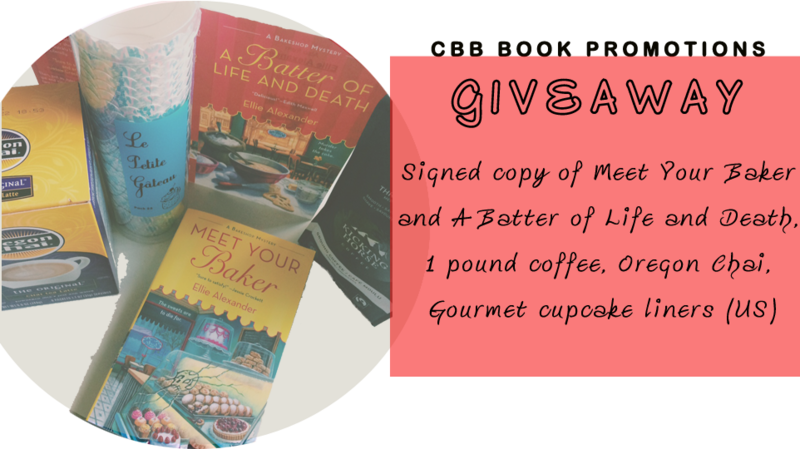 A Batter of Life and Death is a delicious treat of a read; a well-balanced mix of mystery and warmth, sprinkled with flavors of romance, humor, and family, all topped off with a hearty serving of mouth-watering recipes. Best to be enjoyed with your favorite cup of coffee and a tasty treat – trust me, it’ll help to have something to snack on as you read about all the great-sounding treats Jules bakes up! Thanks for sharing Batter of Life and Death on your blog. It’s nice to have an idea of what the book is about before purchasing it. I’m so glad you enjoyed it! Excellent review! Thank you so much for hosting a tour stop and sharing your thoughts!